Mwai, Daniel . 2016. “Catastrophic Health Expenditure and household Impoverishment: a Case of Prevalence of Non-Communicable Diseases in Kenya.” Epidemiology Biostatistics and Public Health 13:1: . Non-Communicable Diseases (NCDs) have become one of the leading causes of morbidity and mortality in Kenya. Their claim on financial and time resources adversely affects household welfare. Households predominantly pay healthcare costs for NCDs in Kenya as Out of Pocket expenditure (OOP). Health expenditure on NCDs stands at 6.2% of total health expenditure, which is 0.4% of the total gross domestic product of the country. This expenditure scenario has implications on household welfare through catastrophic expenditure in Kenya. Most studies done on catastrophic expenditure in Kenya have not looked at the effect of NCDs on poverty. Methods: This paper has investigated the determinants of catastrophic health spending and its effect on household welfare with special focus on NCDs. National household level survey data on expenditure and utilization is used. 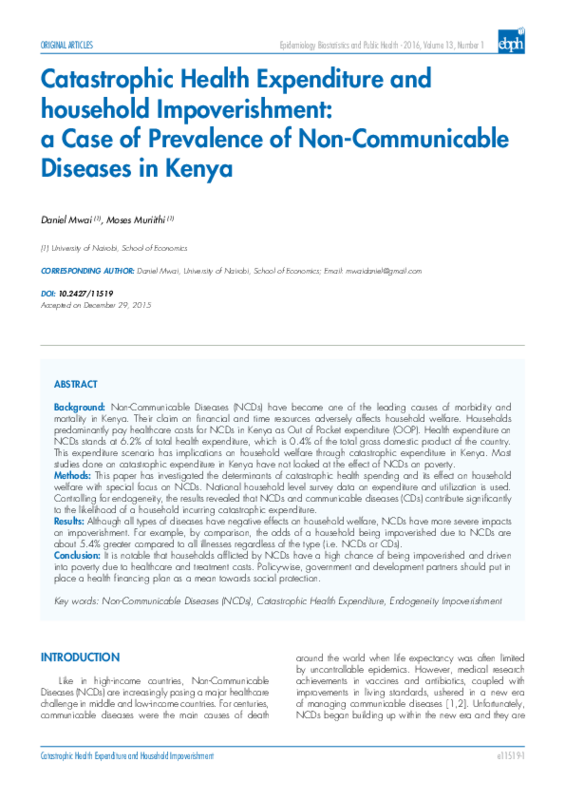 Controlling for endogeneity, the results revealed that NCDs and communicable diseases (CDs) contribute significantly to the likelihood of a household incurring catastrophic expenditure. Results: Although all types of diseases have negative effects on household welfare, NCDs have more severe impacts on impoverishment. For example, by comparison, the odds of a household being impoverished due to NCDs are about 5.4% greater compared to all illnesses regardless of the type (i.e. NCDs or CDs). Conclusion: It is notable that households afflicted by NCDs have a high chance of being impoverished and driven into poverty due to healthcare and treatment costs. Policy-wise, government and development partners should put in place a health financing plan as a mean towards social protection.